This is a photo of Totality, an art installation by Katie Paterson. It is part of an exhibition called A Certain Kind of Light that is on at Eastbourne's Towner Gallery at the moment. A Certain Kind of Light explores how artists have responded to light, its materiality, transience and effect. 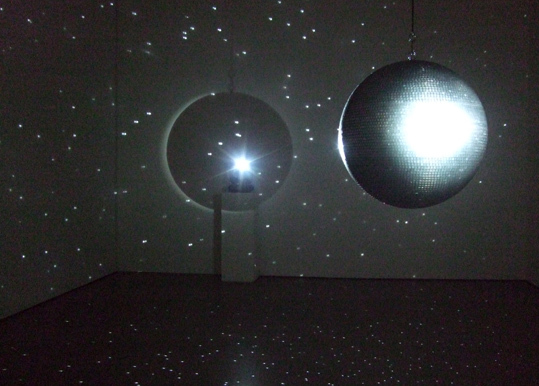 Katie Paterson's glitterball is made with images of almost every solar eclipse that has been known to humans. The images move across the room, reflecting the progression of an eclipse. It is pretty stunning to see - although all of the exhibits were impressive. There is due to be a real solar eclipse on 26 February. It will be an annular eclipse, meaning the sun will look like a ring of fire around a dark central circle. The eclipse should be visible from the southern tip of South America to Angola in Africa. Sadly it will not be visible at all in London, but you could pop down to Eastbourne and see Totality to make up for that.